The Sterling Style Academy launches an instructor led and facilitated, LIVE e-learning virtual classroom, online training certification program to become a Personal Stylist. This online Personal Stylist training program integrates the curriculum presented in our 3 & 5 Day Short Courses to become a Color Consultant, Fashion Stylist, Personal Stylist and Personal Shopper into a LIVE e-learning virtual classroom, online training program. This course is led by an instructor through our online learning platform integrating curriculum lectures and interactive learning exercises using online communication platforms such as audio and video conferencing, curriculum application sharing, and whiteboards to simulate in-classroom instruction. This training program is not pre-recorded. You will be interacting with a live instructor through our virtual training room portal. Our instructor led, one-on-one, e-learning virtual classroom, Personal Stylist online training program is focused on the growth and development of our trainees, integrating engaging lessons and content to provide you with a motivating online learning experience. Get certified online as a Personal Stylist in as quickly as 5 days. Get certified as a Color Consultant in as quickly as 1 day. Our instructor led, one-on-one, e-learning virtual classroom, online Personal Stylist training certification program is comprised of 10 lessons for a duration of 2.5 hours per lesson. We recommend enrolling into the lessons chronologically as we have outlined below when enrolling into the certification program. However you may also choose lessons “a-la-carte” according to the subjects you are interested in if you are not interested in obtaining a certificate. 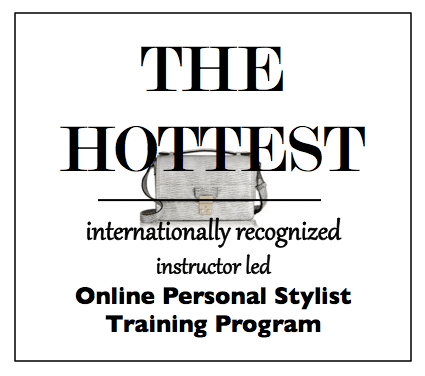 The benefit of our online Personal Stylist training program is the unique teaching methodology we use in order to train our trainees to become experts who are credible and knowledgeable in the field of personal styling - giving you that competitive edge. Upon completion of this program, you will be able to execute convincing theoretical based consultations positioning you to charge top dollar for your consultations. Quiero compartir que me siento muy feliz y satisfecha de mi experiencia por haberme capacitado y ser alumna graduada de Sterling Style Academy. Decidí hacer mis estudios con el método Instructor led online porque tengo actualmente otras actividades y además debo viajar mucho y la verdad es que fue una increíble decisión. Michelle Sterling es una excelente profesora, muy profesional, con mucho conocimiento que lo comparte de manera muy asertiva y amplia y además es un ser humano de altísima calidad. Este método es tan personalizado que tuve a Michelle en cada clase todo el tiempo para mí enfocada en enseñarme cada detalle a lo largo de todas mis clases, que más podía pedir? Las tareas que debía realizar eran revisadas y corregidas con la dedicación requerida y cada uno de los libros y videos son un invaluable recurso y herramienta complementarios. Recomiendo a todas las personas que quieran estudiar en una prestigiosa institución y a distancia hacerlo con Sterling Style Academy. Press submit to make your credit card investment today. Advise you on how to begin building your website advertising presence and media kit. Homework assignments will need to be completed in between lessons. Upon completion of Lesson 1 & 2 and review of your homework assignment, you are eligible to receive a certificate as a Certified Color Consultant if you choose not to pursue any further education. Upon completion of this 10 - lesson program you will receive a certificate as a Certified Personal Stylist. Register per lesson for an investment of US$498. All Sterling Style Academy online training programs are non-refundable and are billed through Global Image Group, Inc.
Ofrecemos clases en español para las lecciones 1, 2, 5, 7 y 8. Al término de los 5 lecciónes, recibirá un certificado como asesor de color, estilo, y moda y como personal shopper. Training will be scheduled at a mutually convenient time for the student and the instructor. Generally we do not schedule training over the weekend and we are available to train stay-at-home mothers in the U.S. while their children are at school. This program will also be convenient for individuals who live in Europe, the Middle East, or in India or Asia who would like to take their classes in the evening, as we are located on the Eastern Time Zone of the United States. Typically training should commence within two weeks of your registration, if not sooner. Once you have registered and made your payment online, we will email you to set up a time to complete your online training program. If you purchased the complete 10 - Lesson Certification Program, the entire program must be completed within a 3 month or less time frame. Upon completion of this program, we recommend enhancing your education with hands-on training at one of our 1-Day Personal Shopper Training Programs located throughout the US, London, and Dubai.